These pictures are from our trip to the Strawberry fields in North Carolina while we were up north visiting my new niece! Landon's dad is a strawberry fanatic, and it looks like lil' Landon is going to follow suit. 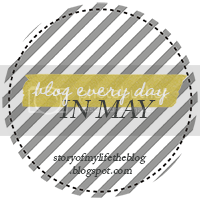 I've decided to jump on the bandwagon (sort of) and get back into the swing of things over here using Jenni D's May Blogging prompts... for this week at least. On of my flaws (which I'll be listing if I stick to this that long) is that I don't do well with being told what to do ;) So typically these prompts don't work out for me. But I think, in this case, it's just what I need to kick this place back into high-gear. I love my blog and I love the way God has used it, both for me and for others who have said the same. And while I have surely enjoyed my time away from the computer, I in no way want to neglect this space!